MARY POPPINS OPENS THE DOOR. Mary Poppins Opens the Door was written by P. L. Travers. 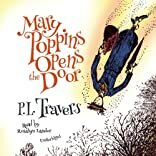 Mary Poppins Opens the Door was published by Collins.